The Historic Smith Hotel, built in 1927, sits nestled between two mountains in Glendale, Utah. Originally built as a boarding house, this grand old structure has taken on a new life as a bed and breakfast. We're proud to provide exceptional accommodation near Zion National Park and Bryce Canyon National Park. The understated elegance of this building fits beautifully into the western atmosphere that's so pervasive here in southern Utah. Guests from around the world make Smith Hotel their home base when visiting the parks from Highway 89. The intimately cozy rooms, all with private baths, provide travelers a restful place to wind down from long days of adventuring. 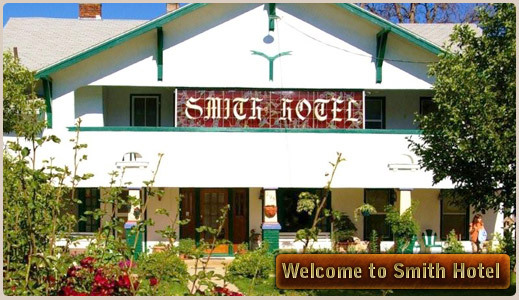 Smith Hotel appeals to both short-stay travelers and those who want to stay a little longer to truly explore the area. Your experience at Smith Hotel will be tailored to fit your schedule and the sights you want to check off your list. Rochelle and Mike, your hosts, have tons of local knowledge and will help you to get the most out of your stay. Call to reserve your spot or book on Expedia right now! For the past 21 years, Rochelle and Mike Schlins have been happily welcoming people to Utah and to our bed and breakfast. We're located in a quaint town with no restaurants, so be sure to grab a bite before arrival. However, we do provide an unbeatable breakfast every morning! There's nothing we like more than sitting down with our guests from all over the world to discuss their stories and offer local travel tips. 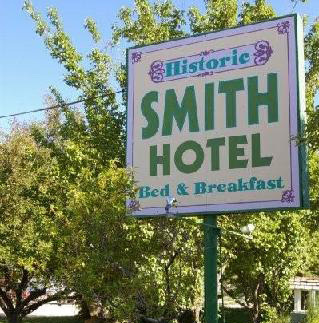 The Smith Hotel was originally built by Joseph and Mary Ellen Smith, important names in Utah history. To this day, the building maintains its beautiful, old-fashioned look. We've filled it with antiques and handmade, wooden furniture to enhance the atmosphere and honor the building's heritage.